Total built-up area according to the title deeds - 134 sq.m. The apartment has an individual entrance and consists of a spacious living room (51.5 sq.m. ), a separate kitchen (14.5 sq.m. ), three bedrooms (two of them with an area of ? ?14 sq.m and one with an area 16 sq.m. ), two bathrooms with toilets (total area 6.5 sq.m) - one common and one en-suite to the third bedroom, closet / wardrobe (3.6 sq.m.). Bonus: enclosed courtyard with an area of 16 sq.m. with sea view. There is a parking space for additional convenience of living in the apartment. High ceilings - 3.1 meters in the living room and kitchen and 2.8 meters in the bedrooms. At the moment the property is "turnkey" finished: kitchen cupboards (MDF gloss), MDF doors, winter / summer air conditioner in the lounge and forced ventilation in the bedrooms, granite tiles in the rooms and the yard, fully equipped bathrooms (Spanish faience and terracotta mirror sinks, shower cubicles, toilets, boiler, hygienic shower in the individual bathroom), lighting fixtures. - dining table with chairs, refrigerator, glass ceramic hob 2, oven, aspirator - in the kitchen. Distance to the sea - 400 meters. The complex was put into operation (Act 16) in 2016. The complex has a swimming pool with a children\\\'s section, a relaxation area with sun loungers and umbrellas with a great sea view, a children\\\'s playground, two parking lots, one of which is on a fenced area. Annual service fee - 550 euros. Annual tax and garbage fee - BGN 214 (ie about EUR 110). Ideal option for a large family or share purchase of the property by several families for the purpose of joint recreation. This property is located in: Bela Slatina, Biela Slatina, Bjala Slatina, Bjela Slatina, Byala Slatina, Byela-Slatina (Ruse, Bulgaria). 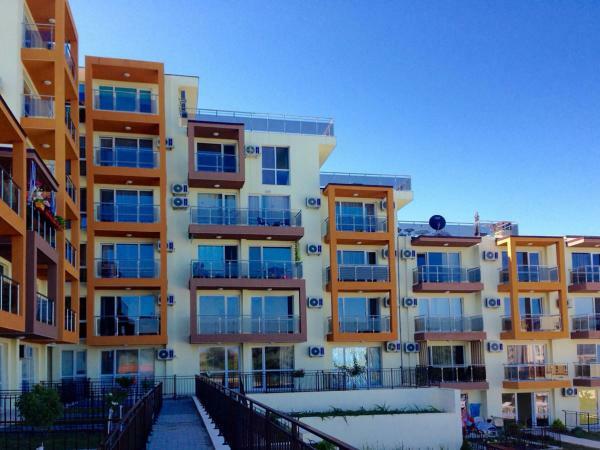 I am interested in other Apartments for Sale from Bulgaria.